The primary author of this month’s IP Musings is John Voisinet along with Ji-Yong (David) Chung. John is a patent agent at Snyder, Clark, Lesch & Chung where David is a partner. David.Chung@snyderllp.com. I can’t believe how backwards this issue is viewed. The PTO is the ‘customer’ buying a disclosure of an invention as an agent of the American public. The public pay for that disclosure with a judicially acknowledged “right to exclude” for a limited time. Fees are just administrative paperwork and mailing costs. That being said, in the exchange between the applicant and the Office, which entity is actually engaging in actions and which entity creates the property right through the action of a grant? Is there any other model out there where the customer has so much control and is the one providing the services? Maybe the PTO will be run like… Applicants are… paying customers. I carry no brief for the idea of an examiner scheduling an interview and then giving the applicant’s attorney the brush off. That said, I get nervous when I read people expressing the idea that applicants (or their attorneys) are “the customers” for the PTO. That sort of thinking rather fundamentally misunderstands what the PTO is and why Congress created it. You carry this “not customer” thing W A Y too far, and it is you that is making a fundamental mistake. Applicants pay for a service – this is without any doubt whatsoever a customer situation. This is not though a “customer is always right and they get whatever they want” situation – but that is a strawman only Malcolm could love. As I have always said: Accept Accept Accept is every bit as wrong as Reject Reject Reject. Applicants are customers and what they have paid for is a full and proper examination under the law. You cannot get more fundamental than that. Applicants pay for a service –… a full and proper examination under the law. Hm, I disagree that this is what an Applicant buys with his/her fee. I am skeptical that the Congress chartered the USPTO because it was worried that inventors did not know how to locate searchers to search the art or attorneys to draft patentability opinions, and wanted to create a convenient clearinghouse in DC where they might find such a service. There is an exchange of money from the applicant for a service by the Office. You wanting to state that other providers may provide similar “services” (but without the end effect of a granted patent) does not change what happens between applicants and the Office. My post stands as correct. You remain in error (and fundamentally so). As I noted above, I simply disagree that this is what the applicant buys with the fee. Allow me to propose an analogy. Panera sells sandwiches and pastries. It also provides WiFi in its cafes. If you go in and buy a pecan roll, and if the pecan roll turns out to be incompletely baked, or stale, or suchlike, then you have both a moral and legal right to get your money back. On the other hand, if you take your pecan roll to the table and it is just fine, but the WiFi is not working, you have no claim (either in law or social convention) to a refund of your money. The WiFi is not really part of the bargain in your pecan-roll-for-money exchange. It is merely a bonus that you happen to get along with your pecan roll. To my mind, the application fee is like the entrance fee that one pays when one enrolls in a tournement. You have bought the right to compete for a prize. The search and examination are just bonuses thrown in. If the quality of the search and/or examination is unsatisfactory, you have no more just a claim against the PTO than the Panera customer who is dissatisfied with the WiFi. If you want a good search or a good patentability assessment, there are qualified providers who can sell them to you (just as there are outfits that can sell you reliable WiFi). That is not what your application fee has bought you from the PTO, however, so it is beside the point to complain if they are unsatisfactory. Your view is simply not in accord with reality. Your agreement is just not necessary for reality to be what it is. The plain fact of the matter is that a customer relationship exists. There really is no way around that fact – no matter how you may want to analogize or may want to disagree. Further, you appear to be inserting a strawman on quality of service provided to the customer. As noted in prior threads, this is just not a meaningful point in view that the examination purchased is an examination for a grant (or not) based on the law. There is not as if yet (and truthfully wanting such is a bad idea) any type of level of “gold-plated” patents granted by the Office. Every granted patent has the same Office-passed level (and listening to the rants of Judicial types won’t change that either). Well, who can take issue with such a well reasoned argument? Nothing establishes a proposition quite so convincingly as bald assertion. I am not sure with what proposition you mean to be taking issue, here. I am emphatically in favor of the clear-&-convincing standard of invalidation for all granted patents in all inter partes district court litigation. Far be it from me to suggest that the quality of examination achieved should in any measure take away from the statutory requirements for clear-&-convincing evidence in district courts. Maybe I can broker a peace here. Greg, you seem to mean that the fees applicants pay entitle them to a seat at the game, and Anon seems to mean that those same fees entitle applicants to a seat in the scout box where all the people around them can comment on the merits of each player. Both sides have some merit. To Anon’s point, the fees we pay are named “search” fee and “examination” fee. Paying such fees at least implies entitlement to a competent search and examination. To Greg’s point, that sense of entitlement is an unrealistic expectation. This is why a lot of us try to convince our clients to do a patentability search before even drafting an application. Prosecuting a case to an invalid patent isn’t in anyone’s best interests. 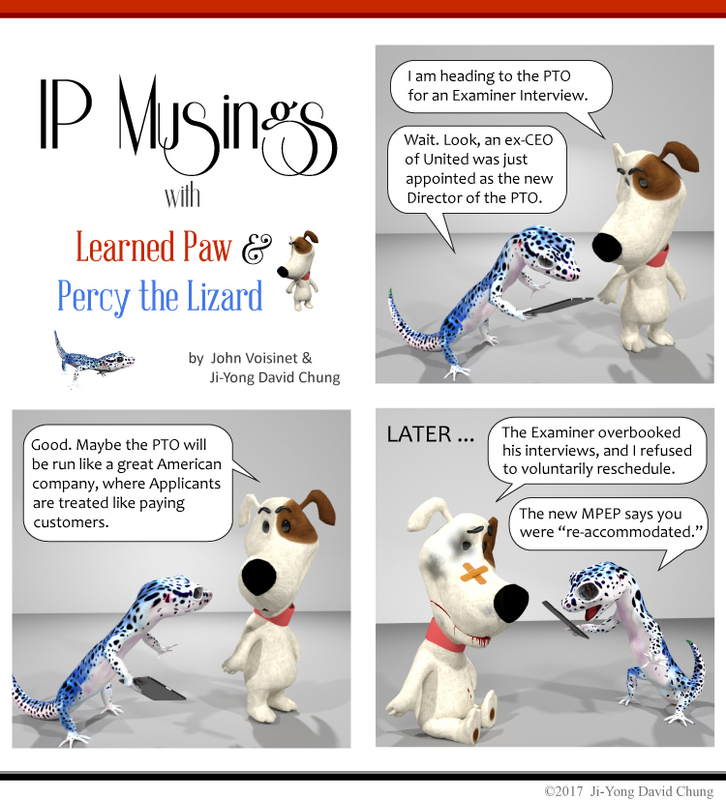 My take: we should be able to rely on the USPTO to perform a competent search and examination, but we can’t solely rely on that. Maybe I can broker a peace here. Just to be clear, there is no peace to be brokered because there is no conflict in the first place. If anon needles me or I needle anon, it is all in good fun. No one is being belligerent. To Anon’s point, the fees we pay are named “search” fee and “examination” fee. Paying such fees at least implies entitlement to a competent search and examination. (1) I do not think that the examination is intended for the applicant’s benefit. It is intended for the public’s benefit. Just because the applicant is the one paying the fee does not mean that this is all for the applicant’s benefit (as one might usually expect in a “customer” model). (2) Caveat emptor. If I go into a store and I see an advertisement that says “Apple iPhone 7, only $4,” I really should be suspicious. One should be similarly suspicious when one sees “Competent Search and Examination, only $1320.” That is not a reasonable price to expect to pay for a good search and examination (even assuming economies of scale), so one cannot be too surprised if it turns out that the search and examination conducted for that price routinely misses important points. Examination is very much something to the applicant’s benefit. That it also complies with the law as well as serves the rest of the Quid Pro Quo does not – and cannot – change that. My positions are far less “bald,” and far more merely definitional. Greg, without sound and sufficient under the law, why then would you have the level of the presumption of validity that a granted patent carries? Your lack of a defensible position there is reflected in your lack of a defensible position here. I understand only too well that you have chosen to “feel” differently, but those feelings just do not carry in our legal discussions. …and as I have also previously pointed out to you (and to Paul), the “set price” cannot be taken in a vacuum as the set prices are set (at the Government’s choice) in conjunction with the system of all set prices including maintenance fees. Please do not confuse yourself by trying to have an apples and oranges comparison. I think that is an important point. In fact, I think that one can even make a more general statement: any government entity should NOT be run like a private corporation. Because corporations are run to maximize shareholder value while government entities are run for the public welfare, the two have divergent goals. The difference in goals does not eradicate the fact that a service for a fee is involved; that customers are involved. Sure, how the service is carried out and how the customers are treated may differ, but customers are what applicants remain. [C]ustomers are what applicants remain. Fair enough. I am not especially eager to argue of the metaphysical details of whether a patent applicant is—in some sense—a customer. I agree that ordinary aspects of customer service (i.e., it is not acceptable for PTO employees to schedule appointments with applicant representatives and then flake on the appointments) should be understood to apply to interactions between applicants and PTO staff. I just worry (as explained above) that there is a misunderstanding in widespread circulation about what an applicant might properly be said to have bought with the application fee. The assertion “you need to treat me like a customer” is fraught with the potential for unpleasant misunderstanding if both parties are not clear about the nature of what is purchased in the exchange. Anything is fraught with the potential for unpleasant misunderstanding and your view of applicants as NOT customers simply does not help. Quite in fact, the error of it leads directly to more of what you say that you are concerned with: misunderstanding. Thanks for some comic relief. Also a reminder to all those somehow convinced that the current Director is the source of their problems that they might regret their wishes for a replacement when they see who they get.